Liverpool remain second in the premier league table after derby day delight versus Everton with forgotten man, Divock Origi, grabbing the only goal of the game in the 96th minute to break Everton hearts. ANDY ROBERTSON (7) – Nothing particularly special from the Scotsman but nonetheless a solid performance down the left hand side once more. Some lovely interplay and passing meant that Liverpool were able to, at times, play some delightful football. We’re just getting used to having a good left-back now! JOE GOMEZ (7.5) – Another solid game from Joe meant that this rating was very easy to give. A slide tackle off the line to stop Everton’s Andre Gomes from scoring meant that Joe Gomez saved Liverpool from going behind in the derby and showed once more why he is rated so highly. This level of quick thinking was notable throughout due to his sharp passing and positive forward play. VIRGIL VAN DIJK (6.5) – Rather controversially, I have given Virgil a 6.5. During the game, Virgil’s passing seemed to be a little off with the captain, for the day, seeming a little lackadaisical at times. However, as the game went on, he became much more astute and finished the game perfectly with an ‘assist’ for Divock Origi. I think it’s fair to say that Virgil saw the funny side of being awarded that. 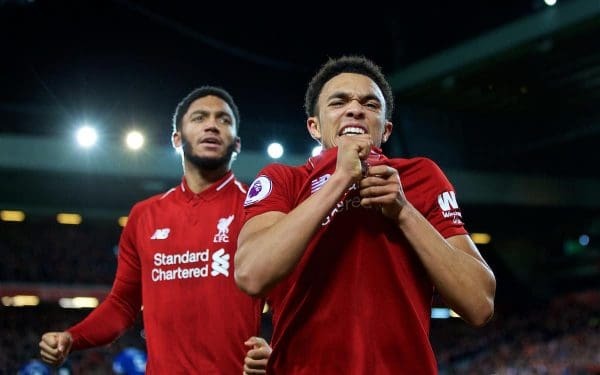 TRENT ALEXANDER-ARNOLD (7) – Rather like Andy Robertson, TAA had a reasonably average game. At times, he was tested by Bernard and Richarlison but worked very hard to ensure that they were not to get past. Trent’s corner taking has been rather poor lately, with many not even getting past the first man. In football, that is a crime. However, being the only scouser standing in the Merseyside derby, I’m sure he very much enjoyed yesterday. GEORGINIO WIJNALDUM (6.5) – Of late, Gini Wijnaldum’s performances haven’t been up to scratch by any means. A slightly improved performance means that his rating has been able to increase with a lively start to the game showing why he is rated by Jurgen Klopp as he won the ball back before Salah created a wonderful chance for Sadio Mane. Unfortunately, he drifted off at times and went rather missing once more. FABINHO (7.5) – Clearly looking like a great buy, Fabinho looks already accustomed to the English game. His tackling was tough, fair and spot on during the entirety of the match, doing the exact job that Klopp will want him to. When he got the ball, he released quickly and broke down the Everton attack in the interim. A truly impressive first Merseyside derby. ROBERTO FIRMINO (5) – A particularly lacklustre game in the Number 10 role meant that Firmino found himself picking the ball up just in front of the centre halves! Some poor interplay contributed to a bang average score and performance as a whole from Bobby. I think it’s almost crystal clear that he has to play as the number 9 and ironically, that is the number on the back of his shirt. XHERDAN SHAQIRI (7) – Xherdan is one of our most creative and lively players. He picked up the ball and drove at the Everton backline and was probably unlucky to be substituted as someone with the quality of Shaq can spring into life at any given moment. With the score poised at 0-0, he was sent through on goal, shooting low into Jordan Pickford and missing a golden opportunity. Like TAA, his corners were poor. Time to hire a corner coach? SADIO MANE (7.5) – Out of all of our attackers this season, it has been Sadio Mane who has been by far the most influential. His strength and pace to run at the defence provide the traits for a wonderful attacking player and this was seen in the derby. In fairness, Sadio could have and maybe should have had three or four. A lovely dink over the top from Mo Salah meant that Mane was able to latch on and volley over the crossbar from close range. A one on one miss also contributes to the clear goal scoring situations that Mane found himself in throughout the game. MOHAMED SALAH (6) – Mo Salah is struggling to adapt to playing as a striker and this is clear with the lack of overall influence that he is gifting to the team. However, there were some bright sparks with a lovely ball over the top to Sadio Mane early on and some smooth link-up play to please the Anfield faithful. Just after the half time interval, Salah was allowed to cut in onto his wand of a left foot and bend one just past Pickford and the post. You have to wonder, if he was still deployed onto the left wing, would he be doing this more often? I think so. DIVOCK ORGI (10) – What a story. On loan last season over in Germany, Divock failed to find his feet and it was a real surprise that he is still in the Liverpool squad. However, in the dying embers of the game, the Merseyside Derby specialist was able to react quickly to a horrendous mistake from Jordan Pickford to win the game for Liverpool in the 96th minute. Along with scoring the winner, Divock did seem remarkably lively, with a lovely run down the wing before hitting a decent ball across the box and also smashing the crossbar from close range. Divock Origi, Liverpool legend!